The Jack Layton Ferry Terminal is in dire need of a makeover. The point of arrival and departure for boats to and from the Toronto Island, which opened in 1972, lacks a proper waiting area and has a roof that consists mostly of a giant hole. In summer, the queues and overcrowded departure area are a spirit-crushing nightmare as 1.3 million people squeeze and sweat to reach one of the city's main tourist attractions. 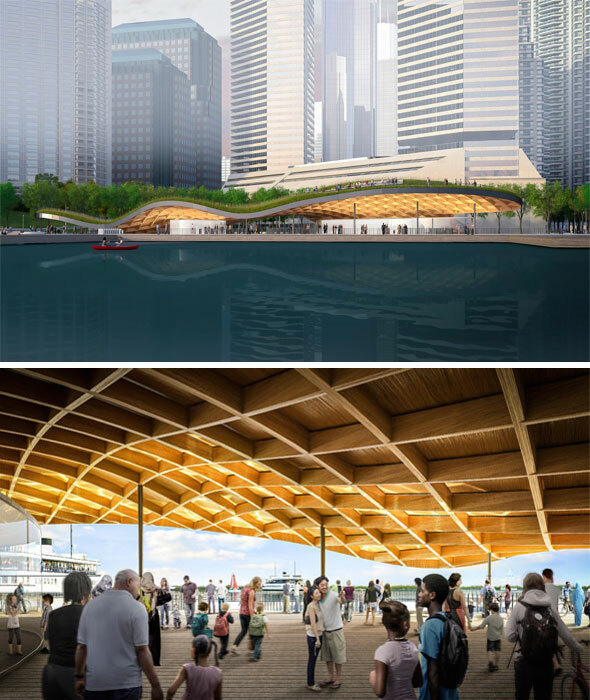 But that could all be about to change now that Waterfront Toronto has shortlisted five designs for a brand new ferry terminal and revitalized Harbour Square Park. Several imagine the widespread use of wood and sculpted green roofs that double as viewing platforms and park space; others offer sculpted hills, cafes and beer gardens, an indoor market, even an artificial geyser that announces ferry departures. The design competition was launched in November 2014, seeking "bold and innovative" proposals for the terminal and surrounding green areas. The results will be used to create a comprehensive plan for the lakefront land that will be phased in over time, Waterfront Toronto says. Here's a look at what's being proposed and complete the feedback form. 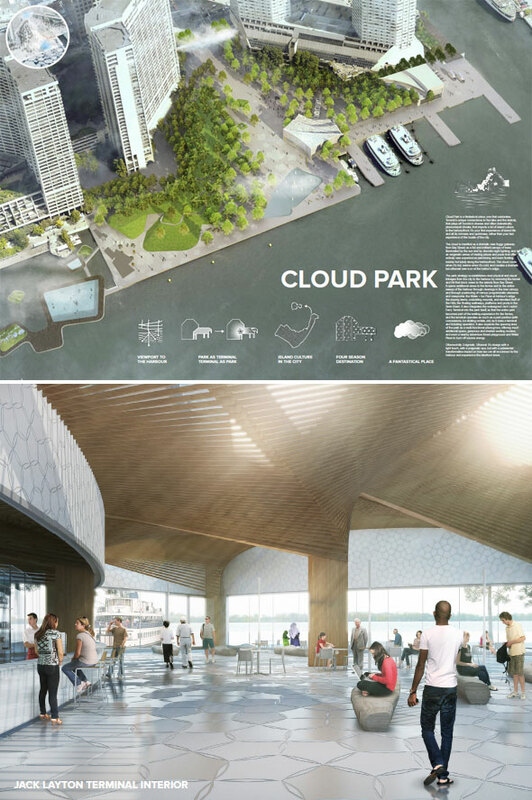 The "Cloud Park" proposed by Stoss Landscape Urbanism, nARCHITECTS, and Toronto-based ZAS Architects plans to blur the lines between the park and ferry terminal. Ferries would dock directly within an overhauled Harbour Square and a small waiting area and ticket hall would be located to the west of the present facility. What's hot: Integrating the ferry docks into the park is a nice touch. What's not: A lack of indoor waiting space could prove problematic during inclement weather. Links: Full proposal and digest. Clement Blanchet Architecture + Batlle i Roig + RVTR + Scott Torrance Landscape Architect Inc. 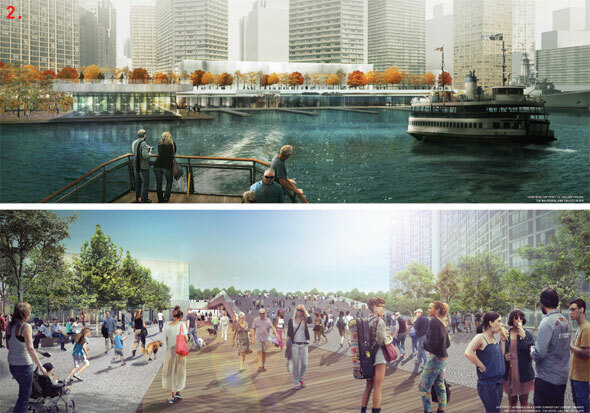 The "Jack Layton City Terminal Park" proposed by a consortium of design firms from Paris, Barcelona, and Toronto would see a pedestrian extension of Bay St. that becomes a "flying pier" overlooking the waterfront. Within the terminal, over and above a greatly expanded arrival and departure area, the team proposes a second-floor botanical conservatory housing threatened tropical plants--"a year-round green beacon visible from the harbour." What's hot: The pedestrian extension of Bay St., a second-floor botanical conservatory of threatened tropical plants are nice ways of making the terminal do more than just serve ferry passengers. What's not: The design of the ferry terminal appears a little conservative. The nature-inspired Diller Scofidio+Renfro, architectsAlliance, and Hood Design concept imagines a heavily landscaped terminal and park area, offering shade in summer and direct sunlight in winter. The "Civic Canopy" would "warp, bend, and break" (hopefully in design only,) allowing trees to grow within the ferry loading area. A "Geyser Clock" would announce each departure with a burst of water, the team says. What's hot: The "Geyser Clock" is a weird but potentially lovable quirk. What's not: The open roof looks great in the sun but could become miserable in the rain. The sculpted "Harbour Landing" proposal draws heavily on natural shapes. 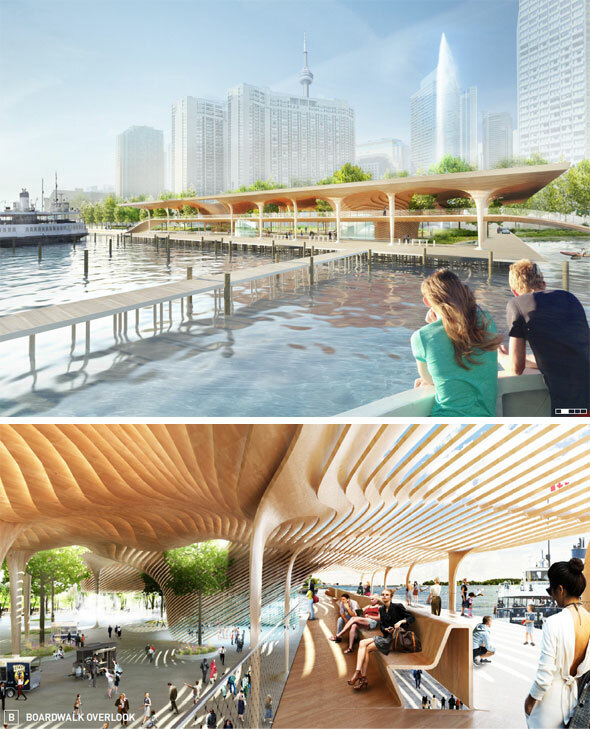 A new waterfront wave deck on the water's edge, and indoor market building/event space, and an publicly accessible green roof form key parts of the lush design. Harbour Square would be heavily landscaped into a series of rolling hills; inside the terminal, the open concept design would provide eating and drinking facilities, an improved ticket hall, and ferry access points that provide views across the water. What's hot: Creative yet simple looking design that maximizes the waterfront location. What's not: Potential for windy conditions in that open-fronted terminal. This colourful and eccentric proposal by Quadrangle Architects, aLLDesign, Janet Rosenberg & Studio would result in a park and terminal area packed with sculptures and architectural flourishes. 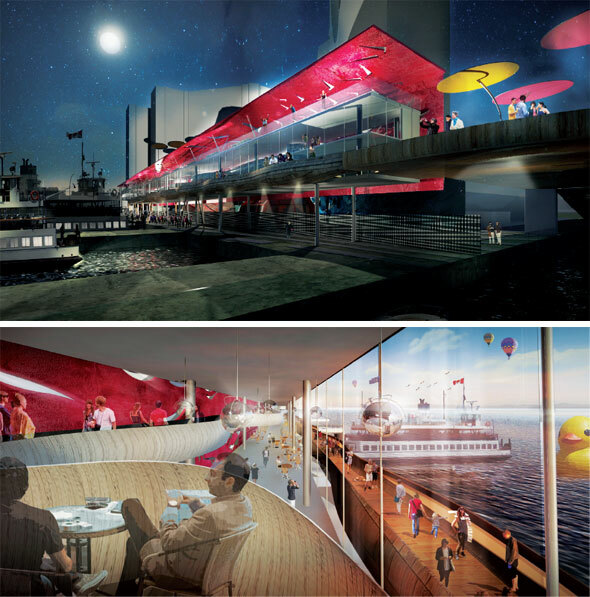 The plans show giant rubber ducks floating in the bay and passengers mingling among marine-inspired "street creatures." There are heated waiting areas, a bar "real and juice," a vehicle drop off area, landscape features that evoke the dunes of the Toronto Island. What's hot: Broad fronted terminal building promises impressive views of the lake. What's not: So many shapes and colours. Possibly too weird for Toronto.